LNER “Director” Class 4-4-0 Engine No. 6399, “Allan-Bane”. This is one of a batch of 24 engines built in 1924 and placed on the North British section of the LNER. IT was something of a shock to the well-established London and North Western and Great Northern Railways when the Midland signified its intention of extending its ramified system southward to its own terminus in London and, as an earnest of the intention, ran a line through Bedford to Hitchin and monopolised a large share of the Great Northern main line into King’s Cross until its own St. Pancras Station was ready in 1868. Still more of a surprise, perhaps, was given to all these three companies when, nearly at the close of last century, in the face of determined opposition, the Manchester, Sheffield and Lincolnshire Railway obtained Parliamentary powers to do exactly the same thing. Prior to the opening of the “London Extension” in 1899, the Manchester, Sheffield and Lincolnshire was an important system crossing the country from Cleethorpes and Grimsby in the east, through Sheffield and Barnsley to Manchester in the west, with a share in the large joint railway known as the Cheshire Lines Committee, and important interests in North Wales. Its southernmost tentacle extended to Annesley, near Nottingham. The powers obtained enabled the M.S. and L. Company to prolong this line southward through Nottingham, Leicester and Rugby to a junction with the London Metropolitan Railway, which had advanced northward to a point beyond Aylesbury. As a result of this vastly important development the provincial railway required a new name, and included in the Parliamentary powers was the authority to change its name from Manchester, Sheffield and Lincolnshire to the imposing title of “Great Central” Railway. In due course the hundred miles of vastly expensive new line were completed. The Great Northern took the opportunity of combining with the Great Central in the building of the magnificent Victoria Station at Nottingham, while another big station had to be erected at Leicester. Regardless of expense, the main line was laid in such a manner as to invite the highest speeds being run over it; and then, at the London end, it was necessary to build independent lines inward from Harrow and a new terminus and a big goods station at Marylebone. This last section involved some engineering problems, not the least of which was the tunnelling under the corner of the famous Lord’s cricket ground, which involved temporarily opening up the ground and, of course, the payment of a heavy sum of money by way of compensation to the Marylebone Cricket Club. Whether the Great Central Extension to London would ever have been built and opened if the grouping of the railways had been foreseen is very difficult to determine. It has hardly attracted a through passenger traffic between London and the Midlands and the North sufficient to justify the enormous expense of its construction, although valuable suburban traffic has been built up in the outskirts of London, Leicester and Nottingham. But a very important link was opened shortly after-wards, between the Great Central Railway at Woodford Junction and the Great Western at Banbury, over which there now pass several well-known through expresses between the North East Coast of England and the South Wales ports and South Coast watering places. Another valuable use to which the Great Central main line is put is the carriage of vast quantities of coal from the Yorkshire and Nottinghamshire coalfields to London and also to various parts of the West of England. The failure to attract much traffic to its express trains has not been for want of inducements. As soon as the line had “consolidated” - that is, the embankments and cuttings had properly settled down so that high speed running could safely be permitted - some very-fast train services were instituted. As the last-comer to London, and therefore in the position of having to take the best route left, the Great Central has the most difficult of all the main lines going out of London north-ward, so far as gradients are concerned, but these have never been allowed to stand in the way of the speed of its express trains. Quite early the 103 miles between London and Leicester were scheduled to be covered in 105 minutes, at an average speed of all but 60 miles an hour. The next step was to institute the “Sheffield Special”, making the 164¾ miles from Marylebone to Sheffield without any intermediate stop in 170 minutes. It is the present-day development of the “Sheffield Special”, now extended to Manchester, that forms the subject of our consideration. When it first ran, the “Sheffield Special” was made up to a total of three coaches. The rear one was a slip coach for Nottingham, the remaining two being vestibuled together and constituting the main portion of the train. It was quite a modest problem of haulage, therefore, that was set to the line 4-2-2 engines of the “967” class that were then in use on the London Extension. One of the two Sheffield coaches, by the way, was a “buffet car”, the Great Central having, from its opening, adopted as a “slogan” for its services: “Every express train vestibuled, with buffet car attached”. The Great Central has probably done more than any other British railway - with the possible exception of the Great Eastern - to popularise the “Restaurant Car”, or real travelling restaurant, rather than the more exclusive “Dining Saloon”, and gradually all the railways of the country have come into line with this progressive policy. As time went on the “Sheffield Special” grew more popular, and its weight correspondingly increased. The slip coach was altered to serve Leicester as well as Nottingham, being run forward to Loughborough and Nottingham by a following train which proceeded to Grimsby and Cleethorpes. In the years before the war the formation consisted generally of five or six coaches of the latest and heaviest Great Central stock, making a total weight behind the engine tender of 180 to 215 tons, and 35 tons less than this from Leicester onward. Meanwhile the “Atlantics” had been built, and after them the first of the famous “Director” class of 4-4-0 engines, to which the working of this famous train is still entrusted. By now, of course, the main train was running through to Manchester, the Central station being the objective instead of the more usual London Road terminus. Throughout the war the “Sheffield Special” survived, but with stops at both Leicester and Nottingham interrupting the non-stop Sheffield journey. Despite these additions to running time it was only found necessary to slow down the overall running time of the train to Manchester by 20 minutes, from its present time of 4 hours 25 minutes, with the startling result that for some considerable time the Great Central had the fastest of all trains between London and Manchester, although over a route nearly 30 miles longer and vastly harder in grading than the shortest route of its competitors. During the war period, of course, all British express trains were considerably slowed down, in order to reduce the number of trains operating and also the coal consumed. Since the war the non-stop run to Sheffield has not, unfortunately, been reinstated, and the total time from Marylebone to Manchester Central is maintained at 4 hours 25 minutes, in place of the one-time 4 hours 10 minutes. Another addition to the stops has been made at Penistone, which, with Guide Bridge, makes altogether five stops between Marylebone and Manchester. One of the most remarkable features of the working is that the same engine works right through, in the hands of the same crew, for the complete distance of 212¼ miles - for the major part of the year - the second longest continuous engine and crew working in Great Britain. It is no light task, either, the 3.20 p.m. now generally taking out of London seven vehicles of the latest and heaviest LNER stock, making a gross load of some 255 tons behind the tender for the bulk of the journey. Further, this load has to be worked at high speeds over very heavy grades, as we shall see in a moment. The make-up of the train varies a little, but is generally somewhat as follows. On the back is a composite corridor coach for Halifax, which is now provided by the LMS Company and is the only “stranger” in the formation. The Manchester portion of the train consists of a third-class brake, an open third-class car, a composite restaurant ear of the type favoured by the late Great Central Railway (with kitchen in centre flanked by a couple of compartments of each class), a first-class open saloon, a composite first and third-class corridor coach, and a third-class brake next the engine. 3.20 p.m. Marylebone-Manchester, leaving Marylebone. 4-6-0 Locomotive No. 6165 “Valour”. And now a word about the engine before we start. Very occasionally one of the 2-cylinder or 4-cylinder 4-6-0 engines makes its appearance on this turn of duty, but the chances are overwhelmingly that our locomotive is of the Great Central 4-4-0 “Director” type. Amongst the handsomest engines running over any part of the London and North Eastern system, simple and straightforward in design and efficient in performance, the “Directors” have proved their worth to the extent of being adopted as one of the standard London and North Eastern express passenger designs for other than the heaviest main line duties, which fall to the “Pacifics”. It is, indeed, a feather in the cap of the Gorton Works staff and of Mr. J. G. Robinson, the designer of the “Directors”, that this has been the only 4-4-0 type of engine built by the LNER since the grouping became effective. Several “Directors” have been introduced into Scotland for working the heavy Edinburgh-Glasgow and Edinburgh-Perth services of the late North British Railway, and that another recent innovation has been the use of “Directors” on the West Riding and Harrogate Pullman services of the Great Northern section of the line. Smartness has always been the keynote of Great Central working, and punctual to the second we move out of the terminus - in strict confidence I may tell you that I have occasionally known the 3.20 down leave a shade in front of time, though it ought not to do so! Whether or not the Metropolitan Railway had any conception when laying its lines, of the speeds that its powerful ally would desire to maintain, it is difficult to say, but the former has certainly provided some terribly steep gradients for the first 40 miles of our journey. The first of them begins at the platform end and takes us up for nearly three miles to a “summit” at the point where we cross over the “Outer Circle” of the LMS at West Hampstead. For the second and third miles this gradually steepens from 1 in 213 to 1 in 87 - a stiff start, indeed! Then there is a smart little drop to Neasden junction for over a mile at 1 in 95, on which we may attain anything up to 70 miles an hour, at no more than five miles from the start - a feat that could not lie paralleled on any other main line out of London. At Neasden there diverges to the left the alternative Great Central main line to the North, via Northolt Junction and the Great Western and Great Central line through High Wycombe. This route, being easier in grading, is used by heavy excursion and freight trains, but its increased journey of 41 miles rules it out for the fastest expresses which, with one exception, unless calling at Wycombe, take the original and shorter Aylesbury route. Profile of gradients, Marylebone to Leicester, LNER. From Neasden we climb through Wembley to Harrow, and shall breast the last 14 miles at 1 in 94-105, to the slopes of the famous “Hill”, at about 40 m.p.h. or slightly over. Then comes a swift drop at 1 in 176 to a maximum of 60 an hour through Pinner; a rise, partly at 1 in 145, to Northwood, which we top at about 50, and falling grades, at 1 in 176-140, to the neighbourhood of Rickmansworth, where again we may expect a maximum of round about 70 an hour. Now, just when we are most needing our momentum, for the tremendous climb through the Chilterns that follows, it becomes necessary for our driver drastically to slacken his train round the sharp curve at Rickmansworth, to a speed of 15 miles an hour. Here the electrically-worked section of the Metropolitan line comes to an end, and with it the “colour-light” signals that have governed our progress most of the way from Marylebone to this point. We have travelled 17¼ miles and have taken about 22 minutes to do it. Now comes the gruelling rise to Amersham. Through Chorley Wood and Chalfont Road we mount, all the way at 1 in 105, until we have had no less than six miles of it right off. The speed averages 35 miles an hour or slightly over - good work, too, in view of the train-load and the speed at which the ascent was begun. But the crew doubtless heave a sigh of relief when we breast Amersham and have some easier travelling ahead. Down to Missenden we cross the “seventy” line; past Wendover and Stoke Mandeville the rate is 75 an hour and upward, and we ease down slightly to pass through the new station at Aylesbury. We have now covered 38 miles from the start, in 45 or 46 minutes. Six-and-a-half miles later we reduce speed to branch to the left off the old Metropolitan on to the Great Central proper at Quainton Road junction, and in less than three minutes more we join, at Grendon Underwood Junction, the loop line that has come from Neasden through High Wycombe. Nearly 47 miles from the start in 55 minutes leaves us only 54 minutes in which to complete the next 56 miles to Leicester. From here to Nottingham the steepest grade has been kept down to 1 in 176 by careful engineering, but there are some long stretches at this inclination, calling for hard work on the part of the engine. As the gradient profile shows, the bulk of the next 15 miles is adverse to the engine, largely at 1 in 176; but we shall find that our “Director” sails cheerfully up the banks at over 50 miles an hour, the speed seldom falling below about 52 and rising to just over 65 or so in the short intervening dips. Then we hurry over a sort of switchback “tableland”, past Culworth Junction, where the Banbury “spur” from the Great Western comes in on the left, and Woodford and Hinton, an important junction and locomotive depot. Thirty-four miles to Leicester, and only just about 32 minutes in which to cover them! Scooping up a fresh supply of water from Charwelton troughs, we dash into Catesby Tunnel - the longest of all south of Sheffield, measuring from end to end 1¾ miles - and, bowling down 6½ miles at the 1 in 176 grade, probably touch 80 miles an hour by the time we pass Braunston. We notice, by the way, that all the stations on this stretch of the line, from Calvert onward, are of the “island platform” type. That is to say, one platform serves both up and down lines, which are “looped” round both sides of it. The curves round the platforms are in no case of less than a mile radius, so that we are barely aware of their presence, even at the highest speeds. Breasting Rugby in about 91 minutes from London, we swing over the great girder bridge carrying our route across the whole width of the approach lines and sidings to Rugby Station on the LMS. Shortly after passing Lutterworth we reach the top of the second long downhill stretch and, accelerating gloriously, we probably just reach or even exceed another 80 an hour, prolonged through Whetstone right into the suburbs of Leicester, before drawing up smartly at Leicester platform. We have neatly covered the 103 miles in exactly the allotted span of 109 minutes. Only two minutes are allowed for the stop, but they are sufficient to enable us to see that even so big a station as Leicester has been built on the island principle. The main up and down platform is one of the longest in the country. Away again, we have but 25 minutes allowed in which to cover the 23½ miles into Nottingham, and that despite a slow finish round the sharp curves from “Weekday Cross” Junction into the Victoria Station, it is over this stretch that the fastest Great Central run of the day is made, the early morning newspaper express having to cover the 22½ miles to the Arkwright Street Station at Nottingham in no more than 22 minutes, start to stop. Such times involve dashing down to Loughborough at a speed reaching up to 78 miles an hour or so; then swinging over Barnston Summit at a minimum of 60, and perhaps touching 80 yet again near Ruddington before we begin to slow for Nottingham. These are tight timings indeed; there is not a single minute to spare anywhere! Off from Nottingham again after a halt of two minutes, once more we have some tough climbing. The profile shows how the major part of the next 11 miles, to Kirkby South Junction, is as steeply ascending as 1 in 131. If we get up this ascent in no more than 17 minutes we shall do well. We are now on to the original Manchester, Sheffield and Lincolnshire line, and henceforward are well into the coalfield area on to Sheffield. Broken grades to Pilsley herald the long descent from there to Staveley, on which we shall achieve our last really high speed of the journey, probably at least 75 miles an hour, but possibly higher still. Then we negotiate a very curved section of the line, taking water for the second time at Eckington troughs, and so manage, again with no margin of time, to come to a halt in the grimy city of Sheffield at the Victoria Station, 48 minutes alter leaving Nottingham (38¼ miles) at 6.26 p.m. Profile of gradients, Leicester to Manchester, LNER. Here we are saddled with the addition of a through coach from Bournemouth to Bradford, attached in rear, which, fortunately, we have not to take further than Penistone. For this journey has “the sting in its tail”. Look at the gradients west of Sheffield! One in 132-120-131-160-100-130-124-135 - 18½ miles of it without a break - what a task for an engine to face after having been continuously at work at high speeds for hours! Yet up we soar, loudly vocal but without apparent difficulty. Gradually the speed creeps up through the “thirties”, until possibly we just top the “forty” mark before slowing down for Penistone. Here we leave our through Halifax coach, as well as the Bournemouth-Bradford coach that was attached at Sheffield, so that the load is lightened to six vehicles for the last stage of the climb - from Penistone to Dunford Bridge. We are now well up into the Pennines - the “Backbone of England” and see the hills closing in on every hand. Directly we are through Dunford we make straight for the mountain face and enter Woodhead Tunnel. Space does not permit any detailed description of this remarkable bore; suffice it to say that its total length of 13 yards over three miles makes it the longest tunnel, by a handsome margin, on the whole of the LNER system. Actually there are two tunnels, one for the down line and one for the up, falling in our direction at 1 in 200. A considerable amount of money was spent recently in improving the ventilation of Woodhead Tunnel, which was particularly bad on the up road, owing to the lower speed and harder working of the engines on the up gradient. Once through the tunnel and past Woodhead, we hurry down the long descent to Manchester. Full speed downhill is inadvisable, owing to the constant succession of reverse curves in the line, as we skirt the margin of the picturesque string of lakes on the right which is as a matter of fact, a series of reservoirs supplying water to towns on the east side of Manchester. We are not likely to exceed 65 miles an hour; if we should touch 70 for a moment, we shall find it quite fast enough to be pleasant. Approaching Dinting, we are slowed to 40 miles an hour for the sharp curve leading on to Dinting Viaduct, This structure, in its magnitude, is a fit companion to Woodhead Tunnel; it is 1,200 ft long, and reaches a maximum height of 130 ft above the valley that it spans. A few minutes later we draw up at Guide Bridge, where important connections are made to Oldham, Ashton, Stockport and other towns fringing Manchester on the east. A final run of 11¼ miles, right round the southern suburbs of Manchester, such as Belle Vue and Levenshulme, brings us into the Central Station from a south-westerly direction. This belongs to the Cheshire Lines Committee, in which the LNER is the predominant partner. We roll in at 7.45 p.m, on the stroke of time. We may have taken longer to get there than the trains of our competitors - it is only to be expected, with the longer distance and the heavier grades - but none of them, probably, would have given us such exhilarating bursts of high speed as we have enjoyed to-day on the “3.20 Down Manchester”. 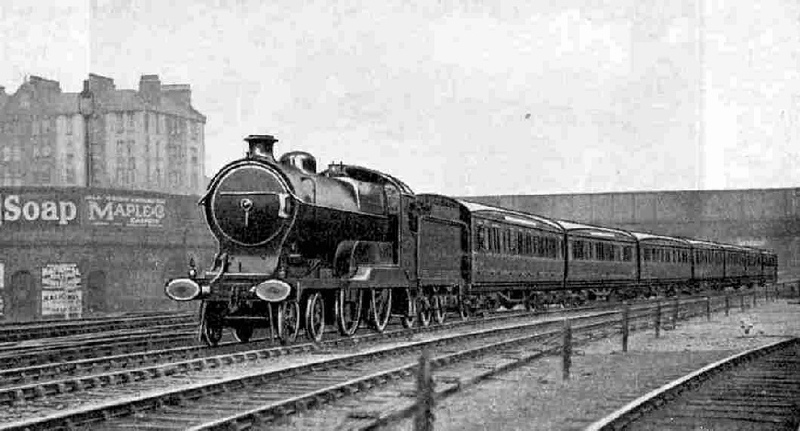 The 3.20 down Manchester Express leaving Marylebone hauled by a “Director” class locomotive. You can read more about “The Flying Scotsman”, “Hook of Holland Boat Express” and “The Midland Scotsman” on this website.